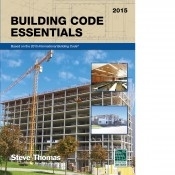 Building Code Essentials, based on the 2015 International Building Code® explores those code provisions essential to understanding the application of the IBC® in a straightforward and easy-to-read format. The user-friendly approach of the text simplifies critical concepts so that users can achieve a more complete understanding of the code’s intent. Full-color illustrations, examples and simplified tables assist the reader in visualizing the code requirements. This up-to-date, step-by-step guide to understanding and applying the code provisions makes it an invaluable companion guide to the IBC® for both new and experienced code users.